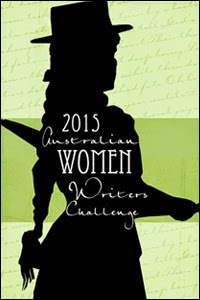 Australian Women Writers Challenge 2015! I’m a little bit slow to get my blog post of intended reads down this year, it’s already coming up to Easter, so here we go! I’m planning the Stella level ( read 4 – review at least 3 ). I’m being conservative, but I know I’ll read more, I’m cheating – if I set my sights on a low level I know I won’t fail! I’ll also be heading back to some favourite women writers this year, with a little bit of Doris lessing, no, not Australian, but a favourite, and a bit of Elizabeth Jolley. I stopped reading Jolley when she passed away a few years ago because I didn’t ever want to find myself in the position of not ever having another Jolley to read, but there are so many that I’ll have forgotten them by the time I come back to them again, and anyway, there’s a finite number of books you can read in your lifetime so might as well make them good ones! Thank you for the follow on my blog! I am trying to get into a habit of blogging more but also finding new bloggers to follow! I also need to expand my library of novels to read as I am quite a chic-lit rut and only occasionally try something new so your blog has inspired me to push myself! Julie, thanks for the follow. And glad to have encountered your blog and website. Shine on.